Many modern scientific accomplishments are truly amazing and have changed ou r lives dramatically. From NASA landing men on the moon, to wireless radios and home computers combining to become the world-wide internet, the power of the human brain to create is a virtual miracle. she worked with. She saw no danger and carried test tubes full of radioactive materials in her pocket and stored them in her desk drawer marveling at how they glowed in the dark. As smart as Curie was, it’s now obvious further study was needed. Another instance where initial scientific study was dangerously incomplete was with a drug patented in 1954. Thalidomide was to be used as a sleeping pill but was soon discovered to help pregnant women with morning sickness. Though never approved for sale in the US, millions of Thalidomide pills were given free to doctors for testing, who then distributed them to pregnant women. It was later discovered that Thalidomide created heartbreaking birth defects. In 1988 another patented drug was introduced to big fanfare, the anti-depressant Prozac. It’s in a class of drugs called SSRIs (selective serotonin reuptake inhibitors). 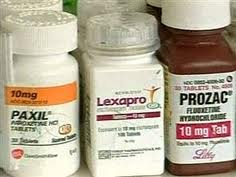 Other drugs in that classification are: Paxil, Celexa, Zoloft, Luvox and Effexor. Today, they’re often prescribed by general practitioners based only on information provided by drug company representatives. According to Dr. Alice Domar of the Harvard Medical School, all you have to do to be prescribed an SSRI drug is to walk into a doctor’s office and say you are not feeling well or are feeling lethargic. Discontinuance of SSRIs is also huge a problem, withdrawal symptoms are horrendous. Many patients trying to stop their medication experience sensations of electric shock or jolts that create intense pain, along with fatigue so intense they can hardly walk or talk. Other withdrawal symptoms include fainting, dizzy spells, insomnia, chest pains, stomach spasms, headaches, racing thoughts, crying spells, nervousness, anxiety, anger and violence. One young man going through it described it as the sensation of all the panic attacks he didn’t have while on the drugs being bottled up inside of him and now coming out at an uncontrollable rate. In Springfield Oregon, 15 year old Kip Kinkel was withdrawing from Prozac when he shot 22 classmates, killing two, after murdering his mother and step father at their home. SSRIs have been widely blamed for many of the school shootings. The most detailed source I’ve found is ssristories.com The website indexes 4,800 violent events linked to SSRIs along with links to media reports of the incidents. Over 50 are school incidents. This site states that school incidents started occurring in 1988, when Prozac was introduced. Just like with radioactivity and the Thalidomide disaster, further, well publicized study of SSRIs is desperately needed NOW. Holistic, non-toxic approaches to mood enhancement will be the subject of a future column.